Gizmo, created by SIPphone is one of my favorite VoIP clients and not just because they have one of the prettiest & slickest looking interfaces. Nope, Gizmo has some of the best features in any softphone client you will find and unlike Skype which uses a proprietary protocol, Gizmo uses the SIP standard. Back in July, Gizmo announced their "All Calls Free" program which allows you to call all of your Gizmo friends for FREE on their landline or mobile phones in 60 Countries. SIPphone said today that it is extending its All Calls Free calling plan to business users world wide. The only catch is that the person you are dialing must also be a Gizmo user with their landline and/or mobile phone registered within the Gizmo client. According to SIPphone, "Callers are encouraged to make free PC-to-PC calls whenever possible. 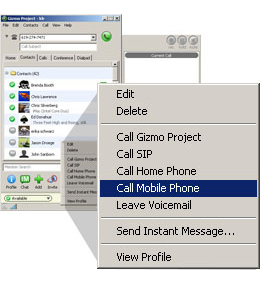 The All Calls Free calling plan applies when both call participants are active Gizmo Project users making a few phone calls per week with Gizmo Project. Free calls may originate from anywhere in the world, but must be to a qualifying number in one of the 60 countries for which the plan is offered. Calls must be made from the caller's contact list to either the "home phone" or "mobile phone" number the call recipient included in his or her profile, and both parties must have shared each others profiles with one another." If the call doesn't qualify under the All Calls Free plan, then you simply pay the low rates offered by SIPphone. The beauty of the SIPPhone client is that it supports dual SIP logons. Thus, you can register with Gizmo's SIP server, as well as any second SIP server you wish, such as an Asterisk IP-PBX, Switchvox, epygi, Mediatrix, etc. Now you can simply deploy Gizmo Project to all your employees (which integrates nicely with Asterisk and other PBXs) and get free calls between all your employees. With this dual SIP configuration, incoming calls from your PBX will be clearly identified, as they are when a call comes from Gizmo. In addition you can choose which outgoing line to use (i.e. Asterisk or Gizmo). If I have some time I'll play around with the latest version of Gizmo Project and report back here.